The American College of Veterinary Nutrition (ACVN) is a small specialty college, with members working in private practice, academic veterinary medicine, and industry. Board-certified veterinary nutritionists in industry regularly contribute to the academic mission of the College through research publications, conference presentations, continuing education efforts, and active membership. As a result, these specialists, like Dr. Lenox, may be invited to author articles on topics within their area of expertise when there is no conflict of interest. Potential conflicts of interest are reviewed by myself as guest section editor, a peer reviewer (who is a member of ACVN and not employed by the same organization as the author), and the administrative/editorial team at Today’s Veterinary Practice. No special advertising consideration is provided to industry companies for whom authors may work. The goal of this column is to provide the latest in unbiased and evidence-based veterinary nutrition from the foremost experts irrespective of their places of employment. We, as always, welcome your feedback on the column and hope the material herein proves of value in your practice. Fatty acids are classified as lipids, a larger macronutrient class that serves a structural role and provides energy, among other functions. Lipids include phospholipids and cholesterol as well as fats, oils, and fatty acids. Location of the first double bond relative to the methyl, or omega, end of the hydrocarbon chain (Figure). FIGURE. Chemical structure of linoleic acid (18:2, omega-6), with important features noted. 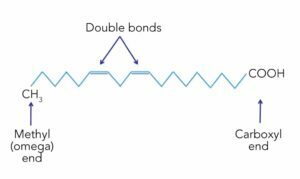 Fatty acids are further defined by the number of double bonds: saturated fats contain no double bonds, monounsaturated fats contain 1 double bond, and polyunsaturated fats contain 2 or more double bonds. 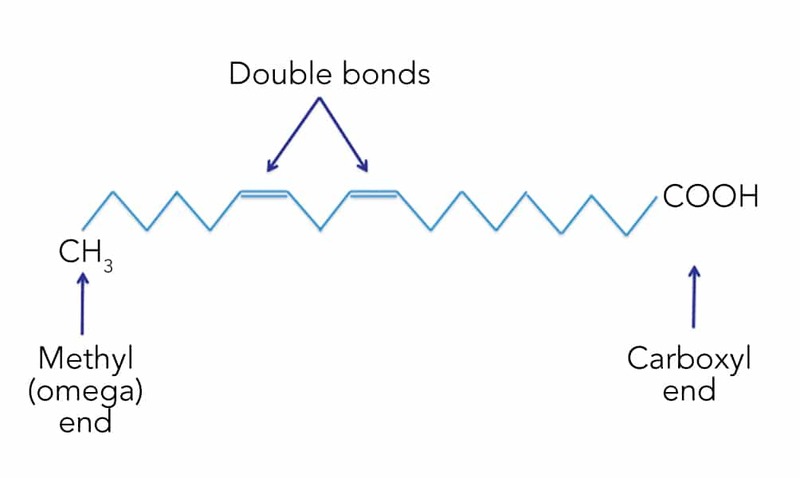 Fatty acids with double bonds are called omega-9, omega-6, or omega-3 based on the location of the first double bond from the methyl (omega) end of the hydrocarbon chain. For example, omega-6 fatty acids, often found in animal tissue and in sunflower and safflower oils, have their first double bond between carbons 6 and 7 from the omega end, whereas omega-3 fatty acids, derived from plant and marine sources, have their first double bond between carbons 3 and 4. Dogs and cats require omega-6 and omega-3 fatty acids in the diet because they cannot produce these essential fatty acids on their own.1 Essential fatty acids and their numeric formulas are listed in Table 1. The omega-3 essential fatty acids are alpha-linolenic acid (ALA, 18:3), eicosapentaenoic acid (EPA, 20:5), and docosahexaenoic acid (DHA, 22:6). EPA and DHA are found primarily in marine sources, including fish oil as well as phytoplankton and other marine plants. It is recommended that all pet food provide essential omega-6 and omega-3 fatty acids. 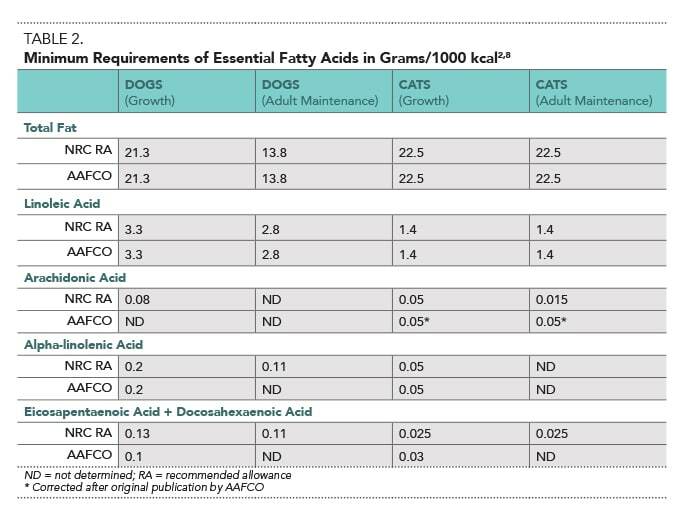 Minimum requirements for total fat, LA, ALA (except for adult cats), EPA + DHA, and AA are published by the NRC, and minimum requirements for the concentration of crude fat, LA, ALA, AA (cats only), and EPA+DHA in pet food are listed in the AAFCO nutrient profiles.2,8 These minimum requirements are listed in Table 2. 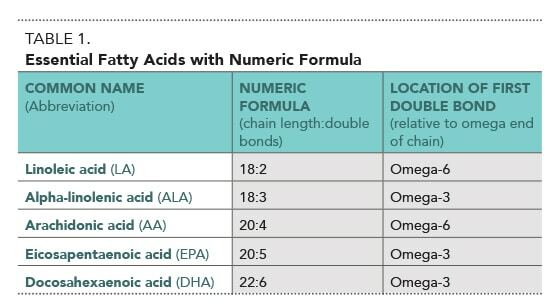 As of 2016, EPA and DHA are described in AAFCO nutrient profiles for growth and reproduction, and the NRC lists these fatty acids as essential. As a result, many pet foods contain sources of EPA and DHA. Fish oil is the main dietary source of EPA and DHA. If supplementing a diet with fatty acids, it is important to choose a quality supplement. When choosing a fish oil supplement, take special care to select one from a reputable company with good quality control practices. Potential exists for nutrient excess (mainly vitamins A and D) and toxin exposure, including mercury exposure with fish oil supplements.10 Calling a manufacturer to inquire about quality control testing and consulting an independent (third party) evaluator are 2 ways to ensure the supplement quality. Dietary fat levels can be adjusted to help manage disease. Adjusting the amount of dietary fat and specific fatty acids can also affect the energy density of a pet food. Higher fat diets (when tolerated) can increase the energy density of a diet, aiding in weight gain without significantly increasing the volume of food needed to improve body condition. Lower fat diets, which are lower in energy density, can help with weight loss, while providing required essential fatty acids and allowing a patient to consume a larger volume of food without significantly increasing caloric intake. Not all patients can tolerate average amounts of dietary fat. Managing conditions, such as hyperlipidemia, canine pancreatitis, and lymphangiectasia, often necessitates dietary fat restriction (< 20% of total calories from fat).12-14 In some patients, therefore, dietary fat restriction is used as an adjunct therapy in disease management, despite the animal’s body condition and the desired energy density for its diet. Before implementing fat restriction, however, a dietary history should be obtained (Table 4). This helps ensure that, when the patient’s nutritional plan is adjusted, dietary fat is restricted relative to the previous diet. It is also imperative that essential fatty acid requirements be met despite fat restriction. A low fat diet can be provided that meets fatty acid requirements, with most dietary fat coming from essential fatty acids, including LA, ALA, AA, EPA, and DHA. Fatty acids, especially EPA and DHA, have a number of therapeutic uses in dogs and cats that are summarized elsewhere. If fatty acid supplementation is indicated, a full clinical assessment, including medical and dietary history and physical examination, is necessary to determine the most appropriate fatty acid supplement for the patient. Therefore, if the goal is therapeutic supplementation of specific fatty acids, such as omega-3s, those particular fatty acids likely need to be provided in the diet. For example, the most efficient way to increase EPA and DHA in a pet’s diet is to provide these fatty acids in a supplemental form, such as fish oil. It can be challenging, however, to supplement EPA and DHA in the form of fish oil capsules to large dogs because EPA and DHA concentrations in standard fish oil capsules are not extremely high. Cats: 30 to 50 mg/kg. When recommending fish oil supplementation for a patient whose food already contains EPA and DHA, consider reducing the dose of supplemental fish oil. Some diets, such as those designed for skin or joint disease, contain significant quantities of EPA and DHA. With these diets, additional supplementation of EPA and DHA may exceed the NRC safe upper limit for a particular patient, and could be potentially harmful. On the other hand, not all diets or supplements that contain “omega-3 fatty acids” include EPA or DHA. Therefore, reading the ingredient list or supplement information is necessary. In many cases, it may be necessary to call a manufacturer to get the EPA, DHA, and ALA concentrations in a diet or supplement. The NRC has established an adequate intake and a recommended allowance for EPA + DHA for all canine and feline life stages. In addition, a safe upper limit of 2.8 g EPA + DHA per 1000 kcal has been established for puppies, adult dogs, and reproducing dogs. No safe upper limit has been published for cats at any life stage.8 Therefore, I use more caution when supplementing EPA and DHA to cats. Table 5 provides examples of adequate intake, recommended allowance, and safe upper limit for an adult dog weighing 10 kg and an adult cat weighing 5 kg, in addition to suggested total EPA + DHA doses for patients requiring fish oil supplementation. In patients in which dietary fat restriction is recommended—such as those prone to hyperlipidemia or other diseases associated with fat intolerance—supplementation of additional fatty acids could be detrimental. Due to the potential for detrimental effects, use caution when recommending high fat diets or fish oil supplements in certain patients. Have fat-intolerant conditions, such as hyperlipidemia, canine pancreatitis, or lymphangiectasia. Although numerous studies have investigated the potential benefits of fatty acid supplementation, the appropriate type of fatty acid and dose of the supplement are dependent on the patient, history, clinical signs, and concurrent diseases. For multiple reasons, what is appropriate for one patient may not be appropriate for another. Before supplementing a patient with either omega-6 or omega-3 fatty acids, it is important to note that supplements, including fatty acid supplements, can have adverse effects. In addition, although certain patients may benefit from omega-3 and/or omega-6 fatty acid supplementation, most commercial diets contain these fatty acids, albeit at varying levels. Therefore, before supplementing any patient with fatty acids, be sure to get a full diet history and conduct both a clinical and nutritional assessment to determine the best nutritional plan. National Research Council. Fats and fatty acids. Nutrient Requirements of Dogs and Cats. Washington, DC: The National Academies Press, 2006, pp 81-110. Association of American Feed Control Officials. Model bill and regulations. 2016 Official Publication. Champaign, IL: Association of American Feed Control Officials, Inc, 2016, pp 107-240. Rivers JP, Sinclair AJ, Crawford MA. Inability of the cat to desaturate essential fatty acids. Nature 1975; 258(5531):171-173. Bauer JE. Metabolic basis for the essential nature of fatty acids and the unique dietary fatty acid requirements of cats. JAVMA 2006; 229(11):1729-1732. Bauer JE, Dunbar BL, Bigley KE. Dietary flaxseed in dogs results in differential transport and metabolism of (n-3) polyunsaturated fatty acids. J Nutr 1998; 128 (12 Suppl):2641S-2644S. Filburn CR, Griffin D. Canine plasma and erythrocyte response to a docosahexaenoic acid-enriched supplement: Characterization and potential benefits. Vet Ther 2005; 6(1):29-42. Pawlosky RJ, Denkins Y, Ward G, et al. Retinal and brain accretion of long-chain polyunsaturated fatty acids in developing felines: The effects of corn oil-based maternal diets. Am J Clin Nutr 1997; 65(2):465-472. National Research Council. Nutrient requirements and dietary nutrient concentrations. Nutrient Requirements of Dogs and Cats. Washington, DC: The National Academies Press, 2006, pp 354-370. Lenox CE. Timely topics in nutrition: An overview of fatty acids in companion animal medicine. JAVMA 2015; 246(11):1198-1202. Lenox CE, Bauer JE. Potential adverse effects of omega-3 fatty acids in dogs and cats. J Vet Intern Med 2013; 27(2):217-226. National Research Council. Energy. Nutrient Requirements of Dogs and Cats. Washington, DC: The National Academies Press, 2006, pp 28-48. Villaverde C. Nutritional management of exocrine pancreatic diseases. Applied Veterinary Clinical Nutrition. West Sussex, UK: John Wiley & Sons, LTD, 2012, pp 221-234. Fascetti AJ, Delaney SJ. Nutritional management of endocrine diseases. Applied Veterinary Clinical Nutrition. West Sussex, UK: John Wiley & Sons, LTD, 2012, pp 289-300. Cave N. Nutritional management of gastrointestinal diseases. Applied Veterinary Clinical Nutrition. West Sussex, UK: John Wiley & Sons, LTD, 2012, pp 175-220. Baldwin K, Bartges J, Buffington T, et al. AAHA nutritional assessment guidelines for dogs and cats. JAAHA 2010; 46(4):285-296. Bauer JE. Therapeutic use of fish oils in companion animals. JAVMA 2011; 239(11):1441-1451. Waldron MK, Spencer AL, Bauer JE. Role of long-chain polyunsaturated n-3 fatty acids in the development of the nervous system of dogs and cats. JAVMA 1998; 213(5):619-622. Kirby NA, Hester SL, Bauer JE. Dietary fats and the skin and coat of dogs. JAVMA 2007; 230(11):1641-1644. Mueller RS, Fieseler KV, Fettman MJ, et al. Effect of omega-3 fatty acids on canine atopic dermatitis. J Small Anim Pract 2004; 45(6):293-297. Larsen J. Evidence-based benefits of omega-3 fatty acids for dogs and cats. Proc ACVIM Forum, 2011, pp 555-557. Catherine E. Lenox, DVM, Diplomate ACVN, is a scientific affairs manager at Royal Canin USA. Prior to her current position, she spent 3 years in specialty practice. She has been published in the Journal of Veterinary Internal Medicine and the Journal of the American Veterinary Medical Association. Dr. Lenox received her DVM from University of Missouri and completed a residency in veterinary clinical nutrition at Virginia-Maryland Regional College of Veterinary Medicine. Upon completion of this article, the reader should be able to recognize the names and classifications of essential fatty acids, discuss the benefits and precautions of dietary fatty acids in small animal veterinary medicine, and give examples of when to use high fat diets or fatty acid supplements and when to avoid them. This article provides an overview of the roles of fatty acids in canine and feline medicine, including basic properties of fatty acids, sources of essential fatty acids, therapeutic modifications of dietary fat and fatty acids, and areas of caution when supplementing fatty acids. 1. Which of the following is an omega-6 fatty acid and is essential for dogs? 2. True or false: Vegetable oils are a good source of arachidonic acid. 3. Which of the following oils is likely to provide the highest concentrations of essential fatty acids? 4. Supplementation of which of the following oils has the highest concentration of alpha-linolenic acid? 5. 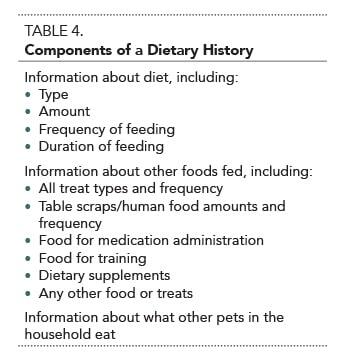 True or false: Diet selection should be based on dietary history in addition to the patient’s medical conditions. 6. Which of the following nutrients is the most energy dense? 7. Caution should be used when supplementing fish oil in which of the following types of patients? 8. High fat diets should be used with caution in which of the following types of patients? 9. Docosahexaenoic acid (DHA) is often supplemented specifically for which types of patients? 10. Which of the following is NOT an essential omega-3 fatty acid?